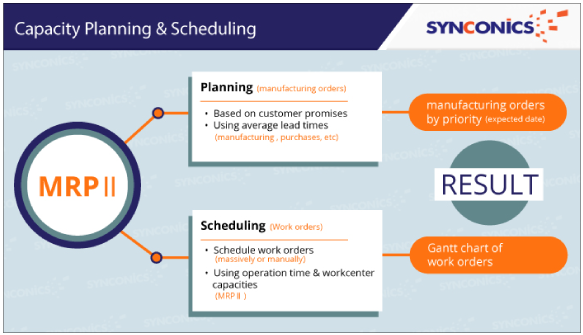 Master Production Schedule | Synconics Technologies Pvt. 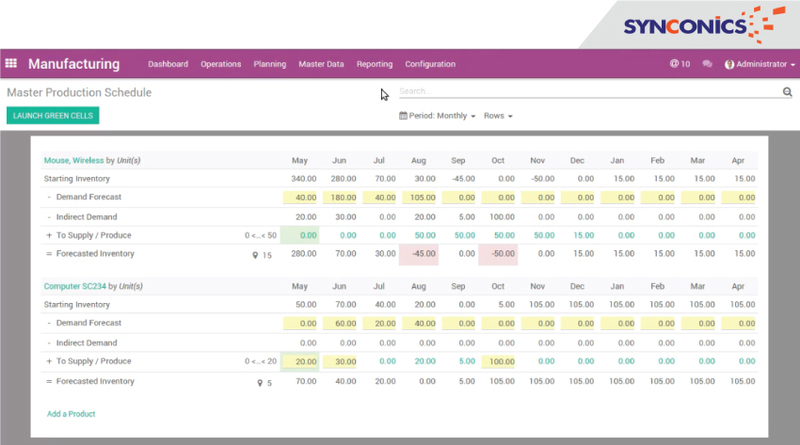 Ltd.
Plan manufacturing: Get a clear view on your whole planning and easily reschedule manufacturing. Organize work orders: Have access to all available resources and plan ahead with your production. Workcenter Capacity: MRP II scheduler using capacities and schedules of workcenters. MPS: To automate scheduling along with existing Minimum Stock Rules and Make-to-Order newly added MPS (Master Production Schedule) will trigger manufacturing order (it could also be used for Purchase as well) based on customer demand. Demand Forecast: To know how much production is needed. As we can see 1st work center is green implying it has work orders, whereas the 2nd is orange which has nothing to do. So we click on Plan Orders and it will show all the MOs for this particular Work Center. The Manufacturing Planner can then go about to launch all the MOs. To automate scheduling along with existing Minimum Stock Rules and Make-to-Order newly added MPS (Master Production Schedule) will trigger manufacturing order (it could also be used for Purchase as well) based on customer demand. Looking at Demand Forecast one will come to know how much production is needed (Go to Manufacturing and under Reporting you will find MPS). One can work by months, weeks or days depending on the industry. There could be interaction between the two products like a computer could also be linked to a mouse. It works taking into consideration the Starting Inventory, Demand Forecast, Indirect Demand (if any, as products might be correlated) and to Supply / Produce. We can put constraints on producing a certain number only, depending on business forecast. It is very efficient and we can show it to suppliers the forecast of the demand and ask to prepare accordingly. For example someone has to produce a bike in 3 months, however wheels take 2 months of production time – so MPS will calculate the figures itself based on the timeline. Figures can be changed as well. Depending on the lead-time, figures in green background should be launched first to suppliers. By launching Green Cells it will trigger MO & POs. Constraints can be easily changed – Minimum, Maximum, Forecasted Quantity etc. One can filter and print certain Rows for specific Suppliers.